If you have missed Molly's amazing new tangle, called arukas, you will find the step-outs by clicking here. It's taken me a few attempts to find my own spin on this ticklish tangle. Today I've had a jolly good whirl pulling, stretching the threads and tying off the ends. Yes, arukas is another favourite tangle. I LOVE how all your versions of a new tangle totally turn me on my head!! Thanks for a wonderful year of inspiration and sharing and I wish you and yours everything that is special, wonder full and relaxing over the Christmas time! Shelly, absolutely beautiful - I cannot tell you how much I enjoy and admire your work! It is always a jolt of pleasure to see your message header come up on my email list - I know I will be delighted by the treasure inside:) Wishing you a very happy Christmas and New Year. Thank you Jakki! It's lovely to know that I am capable of sending 'jolts of pleasure'.....how nice! Great piece. I like the Keeko border and your take on Arukas is very unique. Are they in the process of being woven or unraveling. Like your highlights. 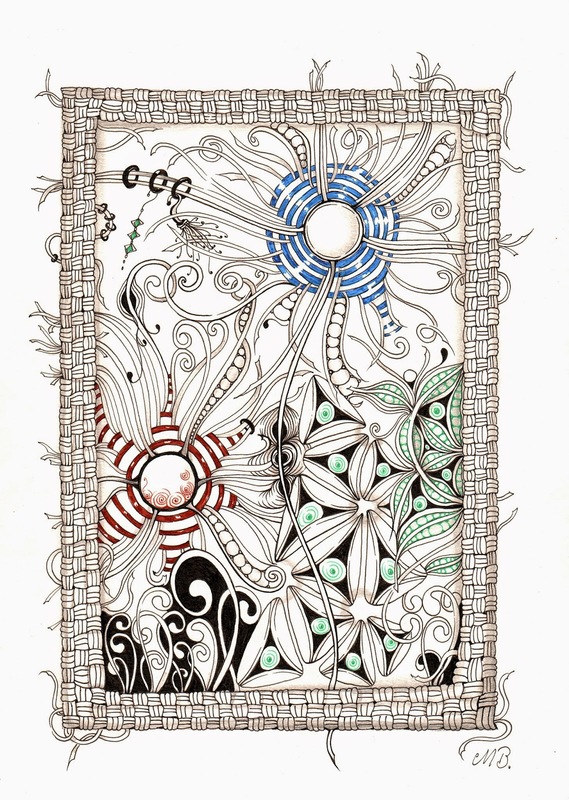 This is a tricky, but intriguing Tangle, and I love what you did with it.thanks for sharing. I haven't taken to Arukas up until now but absolutely LOVE what you've done with it. I have seen it in a new light completely. Arukas is my absolute favourite tangle and your piece might be my fave rendition. Thank you for sharing it with us.